I’ve been loving my new tarp pull outs, although I have yet to use them on my tarp. I’ve found that these work great with a hammockto pull out the sides. This works especially good on extra-wide hammocks (e.g., “doubles”) or those with floppy side rails. Not only does this create larger shoulder and head area for maneuvering and visibility, it creates some structure for the hammock. Both of my clips broke with a few short uses. The small plastic clip snapped when I tried to close the latch. The good news is that these clips are still serviceable and work fine without that clip, although I noticed that the original yellow line tied into the clip and to the elastic pulls unevenly. To update my clip, I took 12 in. (30 cm.) of braided mason line and tied a double fisherman’s knot on the end after I threaded it through both holes in the clip. In this way, the clip is pulled equally and I find it holds better. 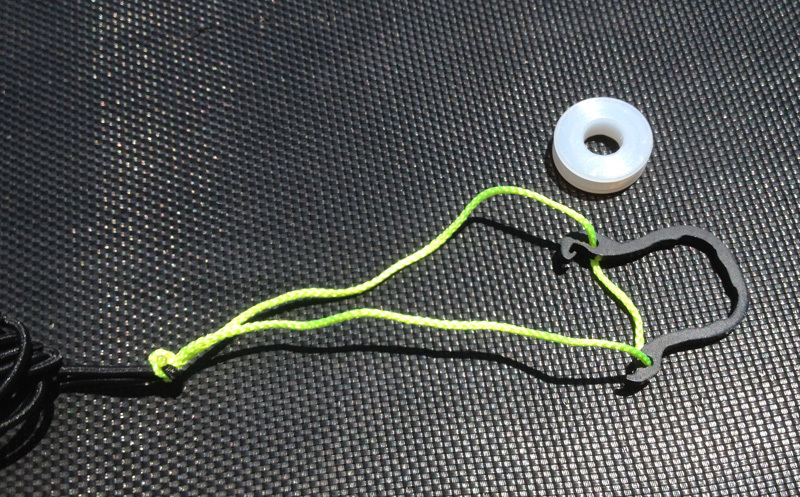 To attach the shock cord to the loop, you can tie a double or single sheet bend knot, or tie a loop in the shock cord and tie a lark’s head knot. I have been modding hammocks for a while now and have seen many pullout systems. I can’t tell if this is a DIY project you made, or if you bought the pull outs. If it is a diy would you mind adding the directions here. Thanks Mate. BTW I loved your book. 😀 Cheers. Thanks Jared! This one is only slightly DIY. It’s a tarp pullout from DutchWare that I slightly tweaked. From the photo, you’ll see that I just added a length of cord to the hardware and added the shock cord to the string. These look really slick, but I am curious as to whether or not they cause wear and tear on the hammock fabric. I am new to hammocking, I will hopefully be getting my WB Blackbird in the next week, so I am not really sure how durable these hammocks are. With that said, I have been reading a lot about hammocking recently, and I must say that this site has been a GREAT resource! Thanks for posting all of these great tips and ideas, they really do help out the novice. Thanks Jake! If you haven’t already, you should check out my book — it’s meant to be a one-stop reference for hammock camping, making it easier to see tips and techniques grouped and presented by topic. Sometimes the web can be more difficult to navigate, although I am working on that on my site. The Warbonnet Blackbird hammock has built-in side tie-outs, so this mod isn’t really necessary. The Hennessy Hammocks also have the side tie-outs, and I just discovered that the 2012-13 models of the Grand Trunk Skeeter Beeter hammocks have side tie-outs. This mod is mostly for simple hammocks. You could always sew in a fabric/nylon webbing loop if you want something more permanent. Another option is the Grip Clips. Jacks “R” Better sells them, as do other retailers. I originally designed these with no locking clip and they work just as well without them. The more tension you place on these, the tighter they grip. The reason the locking clip was added was more for retaining the white backing ring when not in use so it wouldn’t be lost. These have since been beefed up to avoid breakage and I haven’t had any reports of the new design failing. Derek, contact me and I will drop a new set out to you. New to the hammock world. bought a cheap one on sale and fell in love. i am waiting for a double to come to make regular sleeping a little more comfortable. it is from ENO. i heard the length campared to width can be an issue, i really hope not. i have tiny room and cannot go over a 9 foot length in the stand. i made one myseld at about 8 1/2 ft. it is working out great. this page is helpful and i cant wait to go camping with one. Welcome to hammock camping! Sounds like you are going full time–fantastic. The ENO Double Nest is great and you should enjoy it. I have to couch my opinion knowing that hammock comfort is subjective. While there are some hammocks I prefer over others, I’ll take any hammock over the ground. Your mileage may vary. Let me know how it works for you and if you have any questions. I have major back issues and ground camping is not enjoyable anymore, sleeping in a bed is not fun either, I have found relief sleeping in a hammock, I even sleep better. I was worried about side sleeping, but it is doable and comfortable. I would love any opinions on hammocks.